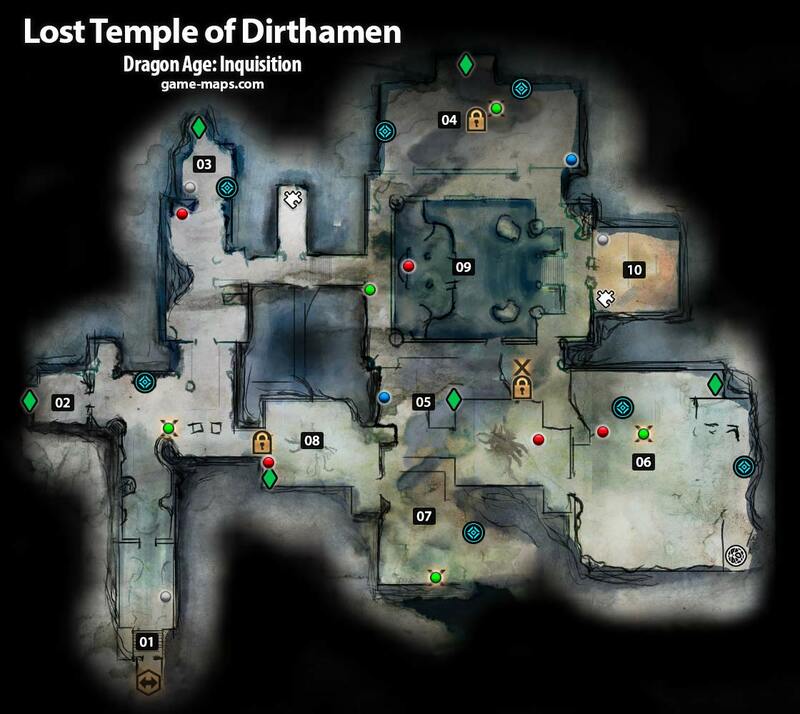 Lost Temple of Dirthamen - Dragon Age: Inquisition Walkthrough, Game Guide and Maps, with Quest and Locations of Camps, Merchants, Rifts, Ocularums, Astrarium, Dungeon Entrences, Landmark (POIs), Crafting Station, Mosaic Piece, Inquisition Agent, Secrets, Party Members, Bottle of Thedas and Codex Entry. WE FEW WHISPER HERE WHERE SHADOW DWELLS. SOME WORDS REMAIN UNUTTERED. TRUTHS ARE PUSHED DOWN, DOWN WHERE THEY SHALL NEVER ARISE AGAIN. DIRTHAMEN IS GONE, HE SAID. OUR HIGHEST ONE BRINGS TO US THIS GRAVEST NEWS. WHAT SHALL WE DO2 WHERE SHALL WE GO 2 WHAT OF THE OLD SECRETS THAT BURN WITHIN OUR HEARTS? THEY WILL COME FOR US IN THE NIGHT THOSE WHO WOULD STEAL THE WORDS FROM OUR LIPS AND OUR GOD NO LONGER RISES TO OUR DEFENSE. WE CLAW AT THE WALLS, AT THE WALLS. NOW. WE PRAY FOR A DAWN THAT WILL NEVER ARRIVE. OUR HIGHEST ONE, HE DECEIVES US. THE HONEYED WORDS THAT DRIP FROM HIS TONGUE WE KNOW THE DESPAIR THEY MASK. WE DISCIPLES OF DIRTHAMEN KNOW TRUTH, NOW As EVER. THE HIGHEST ONE PROMISES SAFETY. I SHALL PROTECT OUR ANCIENT SECRETS, HE CLAIMS ALL THAT DIRTHAMEN ONCE GRANTED US WILL BE SAFE. BUT IT IS OUR BLOOD HE SEEKS A SACRIFICE DARK AND UNHOLY A PRISON OF EVIL TO KEEP US IN AND ALL ELSE OUT. THE HIGHEST ONE CANNOT TAKE THEM FROM US. ONLY DIRTHAMEN, OUR KEEPER, ONLY HE AND IF HE DOES NOT TAKE THE SECRETS THEY ARE OURS FOREVER . HIS MIND WHICH CANNOT THINK HIS TONGUE WHICH CANNOT SPEAK HIS HANDS WHICH CANNOT TOUCH HIS EARS WHICH CANNOT HEAR HIS EYES WHICH CANNOT SEE AND THUS SHALL OUR HIGHEST ONE BE BOUND. HE SHALL JOIN US IN OUR SILENCE. FOR HIS HEART, FOR HIS HEART OUR HIGHEST ONE IS BOUND. THE SECRET THAT HE KEEPS, HE KEEPS WITH US THE VIGIL THAT HE KEEPS, HE KEEPS WITH US HIS FEAR WILL NOT WEAKEN US NO-ONE SHALL COME, DEAR MENTOR. IN OUR ETERNITY, ONLY DARKNESS REIGNS. ITEM: Mosaic Piece x 2 inside dungeon, see map. Place all itemas on altars and summon Highest One.